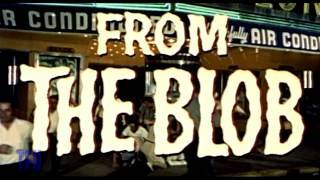 THE BLOB is one of the quintessential films for lovers of those science-fiction/horror/monster/camp films of the 1950s. A red, gigantic, gooey, gelatinous glob arrives from outer space and proceeds to terrorize a small town. The more it eats, the more it grows. Local teenagers, who have witnessed its obscene display of hunger, are ignored until it seems that it's too late. Can the local bad boy (Steve McQueen, in his first leading role) save his 'burb from the sinister slime--and reform himself in the process' A perennial favorite of Saturday afternoon horror shows, the film is still a joy to watch, as the young McQueen battles his parents and the big protoplasmic hunk of Jell-O. Film debut for actor Steve McQueen, where he was billed as Steven. The Laserdisc edition is 15 minutes longer, and contains interviews and trailers. The film came from an idea by Irvine H. Millgate. Color by DeLuxe. Shot at the Valley Forge, Pennsylvania studio.